NASA's Mars rover Curiosity hasn't turned its wheels since landing on the Red Planet two weeks ago, but that's about to change. The Curiosity rover is set to make its first tracks on the Red Planet Tuesday or Wednesday (Aug. 21 or 22), mission team members said. The maiden drive will be something of a test, so the 1-ton robot won't be allowed to stretch its legs right off the bat. "Basically, we want to drive the wheels more than one rev in both directions," said Jeff Biesiadecki of NASA's Jet Propulsion Laboratory in Pasadena, Calif., one of Curiosity's 16 drivers. "What we've got sketched out right now is about a 4-meter drive forward, and about a 90-degree turn in place, and a couple meters backwards." 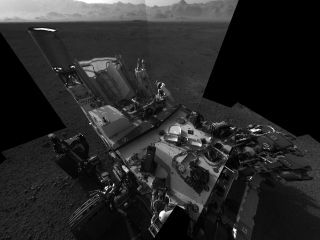 The first drive will come close on the heels of Curiosity's first laser beam test fire on Mars, which occurred Sunday (Aug. 19). The $2.5 billion rover blasted a small stone to try out its ChemCam instrument, which determines the composition of Red Planet rocks by studying their vaporized bits. This image (cut out from a mosaic) shows the view from NASA's Mars rover Curiosity landing site toward the lower reaches of Mount Sharp, where the rover will likely start its ascent through hundreds of feet (meters) of layered deposits. Image taken on Aug. 8, 2012, released Aug. 17. Curiosity touched down inside Mars' huge Gale Crater on the night of Aug. 5. Since then, the rover team has been systematically checking out Curiosity and its 10 science instruments. Researchers want to make sure the six-wheeled robot is ready for its two-year surface mission, which aims to determine whether Mars could ever have supported microbial life. "On Sol 15, we're going to check out the steering actuators," Biesiadecki told SPACE.com. "We're going to run all the steering actuators one at a time — not through their entire range of motion but through both directions — and end them straight. So we should have all our wheels straight at the end of Sol 15." If all goes well, the first drive should occur on Sol 16 (which begins Tuesday afternoon), Biesiadecki added. Curiosity will then pause to commemorate her first tentative steps on Mars. "At the end of that maneuver, we'll be taking images of our tracks," Biesiadecki said. "We'll see the very beginning of our tracks, which I think is going to be kind of a cool picture." The photography isn't just for historical or gee-whiz purposes, though. The team wants to see how much Curiosity sinks into the ground when it's on the move, Biesiadecki said. Curiosity's ultimate destination is the base of Mount Sharp, the 3.4-mile-high (5.5 kilometers) mountain rising from Gale Crater's center. Mars-orbiting spacecraft have spotted signs of clays and sulfates in Mount Sharp's lower reaches, suggesting the area was exposed to liquid water long ago. But the rover's first long drive will take it in a slightly different direction, to a spot about 1,300 feet (400 meters) east of Curiosity's landing site. Scientists are eager to reach this locale — which they've dubbed Glenelg — because it harbors three distinct types of terrain for Curiosity to study, all in one place. Curiosity could begin the trek toward Glenelg a week or so after the steering and wheel checkouts if everything continues to go well, Biesiadecki said. He and the other rover drivers — and the entire mission team, most likely — are very much looking forward to that moment. "For all rover planners, I think I can safely say we're itching to go, and Curiosity's ready to roll," Biesiadecki said.